xsmoke® | xsmoke® e-cigarettes | Try scandinavia’s most popular e-cigarette for free! I am pleasantly surprised. I had heard that you need to spend many more refills than it said on the webshop, and that the batteries couldn’t stay for more than half a day’s consumption. LIE! I used fewer refills (2 a week) and should not charge more than a few times a week. xsmoke gave me my life back! I have been a heavy smoker for many years and have tried everything in quitting smoking, but without success. Actually I had given up to stop smoking, but then I found my way to xsmoke through an acquaintance. I have now been smoke-free for 2 month. Ordered together with a friend two samles of xsmoke, which I already after 2 days received. Unfortunately, one broke. Fortunately, help was not far away – Got in touch with the nice costumer service and was told that I just had to send a picture and then they send a new one. :) All in all, a very nice product and a great costumer service! I have now been smoke-free for about 2£ a day. Half price if the ordinary cigarettes and other smoking cessation products. Have just changed from normal to light without problems. Good customer service! XSmoke.com is one of Scandinavia's largest providers of e-cigarettes. At XSmoke.com we sell the highest quality e-cigarettes, with long battery life and the realistic feel of smoking a regular tobacco cigarette. Our goal is to help you to quit in the easiest possible way and ultimately help you become completely smoke-free. At our online shop you’ll find everything from batteries and refills to packaging solutions for the chargers. XSmoke is a Danish-German company headquartered in Munich. Under Danish law it is not possible to sell e-cigarettes containing nicotine in Denmark, but as a foreign company we are able to legally sell e-cigarettes with nicotine to Danish consumers. It is completely legal for Danish consumers to buy e-cigarettes containing nicotine abroad as long as the product is for personal consumption. Today XSmoke is one of Scandinavia's best-selling e-cigarettes and it is also sold in Germany. You can read more about our e-cigarettes and accessories on Facebook, where you can also ask any further questions you may have about our products. Our friendly customer service will respond with an answer within 24 hours. At XSmoke we strive to provide our customers the best possible service and therefore we are always available by e-mail, phone, and Facebook. Normally, your questions will be answered within 24 hours during weekdays. Electronic cigarettes have become the Danes’ favourite quit-smoking product. They‘re used by thousands of Danes every day. The benefits of our products are obvious. E-cigarettes look like ordinary ones but don‘t contain any of the more than 4000 harmful chemicals that regular cigarettes contain. E-cigarettes will not harm you or your loved ones. Besides the health advantages, e-cigarettes are also a far less expensive alternative to tobacco smoking. You can use our online calculator to find out exactly how much you can save. It’s simple and easy to start using XSmoke e-cigarettes. They consist of two separate parts -- a battery and a refill containing a liquid, with or without nicotine. The battery can be easily charged via the USB port in your computer or with one of our XSmoke chargers for household electrical outlets. When the e-cigarette is charged, you can start vaping immediately, and when you're done you can just put the e-cigarette away in your pocket. What flavors does XSmoke offer? At XSmoke we offer 12 different flavours of e-cigarettes. XSmoke is sold both with and without nicotine and is available with the original tobacco flavour, menthol taste, liquorice, apple or strawberry if you want to try something new and different. You can read more about our different flavours below. In many ways the electronic cigarette resembles an ordinary tobacco cigarette, occasionally even in appearance. However, The content of the two is completely different. With tobacco cigarettes, there is a combustion of tobacco, whereas the e-cigarette simply vaporizes water. The e-cigarette consists of two parts - a refill and battery. The refill the little yellow "filter" with the mouthpiece. It is in this refill the e-liquid with nicotine is located. It is the nicotine that prevents your craving to smoke. it is also in the refill we find the heating element that vaporizes the e-liquid. The refill also acts as a mouthpiece - This is where you inhale the vaporized e-liquid. The large white part at the other end consists of a battery and an LED lamp that imitates the glow of a tobacco cigarette. A refill is similar to a filter from a regular tobacco cigarette. It can be changed to a new refill simply by unscrewing it and screwing a new refill on. This also renews the heating elements, which are located in the refill. There is a microchip in the refill, which controls the LED lamp and the evaporation of the liquid. The heater/heating element is a small spiral shaped metal piece, that quickly heats up when you inhale in the mouthpiece. It is this function that evaporate the e-liquid. The heating element is activated when the microchip sense someone is inhaling in the mouthpiece. All portable electronic devices need a power source, typically a battery. Our e-cigarettes have a lithium battery. 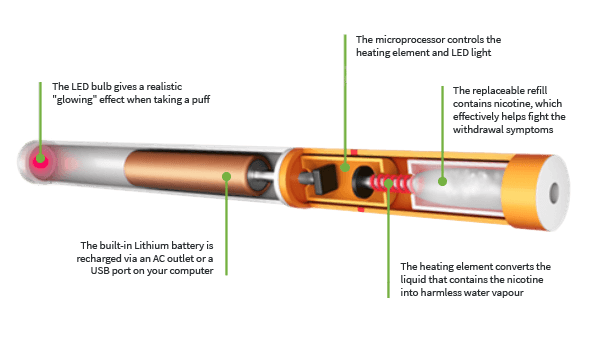 The battery fills up most of the white part of the e-cigarette and it delivers power to the the entire e-cigarette. When the e-cigarette runs out of power it can easily be charged with a included USB charger. Or you can also buy a wall charger, which make it possible to charge your e-cigaret without a computer. Our liquid is a mix of four essential ingredients: water, glycerol, nicotine and aroma/flavor is also possible if you wish. E-liquids are available with many different flavours and nicotine strengths. The nicotine strength is important in relation to switching from tobacco cigarettes to e-cigarettes. For example if a heavy smoke orders e-cigarettes with too little nicotine their craving to smoke will not disappear. In the xsmoke® e-cigarette the e-liquid pretty much refills itself. Whenever you screw on a new refill it is automatically refilled. Smokers of tobacco cigarettes generally have a higher risk of many diseases. The many dangerous poisons in tobacco cigarettes are very harmful to your health. Many of the substances are highly carcinogenic, which is why many smokers at some point in their lives experience some form of cancer. Tobacco cigarettes not only affect the lungs and bronchi, but also the blood and bone marrow, which helps to weakens the immune system. Many of these effects are permanent or takes a very long time to repair. But how does e-cigarettes compare to this? A switch from tobacco cigarettes to e-cigarettes will greatly improve your overall health. E-cigarettes contain none of these harmful substances. Moreover, the lungs are not damaged as with tobacco cigarettes since you only inhale water vapour with e-cigarettes. This makes the risk of deadly diseases strongly reduced with e-cigarettes. Already after 8 hours without tobacco cigarettes the carbon monoxide and oxygen are normalized in the body. The heart is the body's engine and pump. It ensures that all the vital organs are constantly supplied with blood and oxygen. Tobacco smoking has, unfortunately, a very negative effect on this engine. Both blood pressure and heart rate are found to heavily increased among smokers of tobacco cigarettes. Furthermore, the risk of cardiovascular disease greatly increases by smokers of tobacco cigarettes. Smoking also has a negative impact on your skin. The skin changes in many ways, it even changes colour. You might already know the term nicotine stains on your fingers. The grey ash colour on smokers hands comes from a reduced blood flow to the hand. E-cigarettes influence your health very positively, also your teeth. E-cigarettes can improve your smell and sense of taste as quickly as within a few weeks. Regular tobacco cigarettes destroy both your teeth and gums in many ways. Smokers' teeth often get a yellow colour due to the tar in the tobacco. In addition, incidences of caries are much more common by tobacco smokers than non-smokers, including e-cigarette smokers. Can these factors conclude whether e-cigarettes are dangerous? Yes and no. E-cigarettes are a healthier alternative to tobacco cigarettes, but there is still no long-term studies that could describe the long term effects of e-cigarette smoking. But from what we know now, they're not dangerous. There has recently been a debate about e-cigarettes, especially in the EU. So far it has been up to each country to make it's own rules regarding e-cigarettes. The European parliament simply has some guidelines that they would like to see the member states apply. In many European countries the electronic cigarette is legal, but there is a few countries which has made e-cigarettes, to some extend, illegal. Our products are shipped from Germany, which means that we are subjected to German laws. In Germany it is completely legal to sell e-cigarettes with nicotine. So due to he principle of mutual recognition in the EU, you can always safely order from our shop to whichever european country you live in. How much money can you save with e-cigarettes? This is a question many smokers ask themselves. However, the answer to this question is very individual. There are many different products, tastes and prices. E-cigarettes are like other products – you get what you pay for. Often you can find a good offer online. Here at xsmoke® we offer a subscription based delivery, which can save you a lot of money and time. But whatever you choose, e-cigarettes are significantly cheaper than regular tobacco cigarettes. We have made a table over how many money you can save by switching from tobacco cigarettes to e-cigarettes, simply pull the green bar bit higher up on this page. Just inset your daily tobacco cigarettes amount and see how much you can save. As you can see e-cigarettes both have a health and economic benefit. WHICH E-CIGARETTE IS THE BEST FOR ME? Finding the perfect e-cigarette for you isn't always easy. There are many different retailers, stores and webshops from which you can buy them. The easiest way to go from tobacco cigarettes to e-cigarettes is through products like the xsmoke® Original. This has an equal amount of nicotine to a regular Marlboro cigarette and a similar tobacco taste. If you feel like you are already ready for a life without nicotine you can also try out products like the xsmoke® Free. This has the same tobacco taste, but completely nicotine free. We here at xsmoke® have developed a test, that can help you find the right e-cigarette for you. E-cigarettes can both be bought online and offline. We at xsmoke have made a list with positive and negative sides of both methods. In this way we have made it easier for you to find the right solution. The big question is: Should you go to a retail store or stay home and shop online? The advantage of a retail store is, that you can get personalized advice on e-cigarettes and get the e-cigarette directly in the store. But often the cost of staff and storage is simply pushed on to the customer via higher prices. This means that e-cigarettes in retail stores often are significantly more expensive than their online counterparts. On the internet you will find a large selection of e-cigarettes. There are many providers on the internet, which means that there are bound to be some “black sheeps” among. It is therefor very important that you find a good shop. 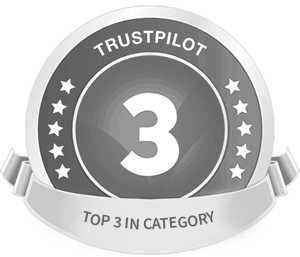 A good shop contains good customer service and customer approvals through services like Trustpilot®. Another good sign is if the contact info is easy to find. Many official payment methods such as Paypal and Visa may also indicate that the webshop is legitimate. We recommend that you away from websites where you have to transfer the money yourself. If you transfer yourself, you are not protected as well from fraud as a consumer. With this knowledge you can now find a good and cheap webshop, where the range of products is much greater than in retail stores. Where does the electronic cigarette come from and who invented it? To answer these questions we have to go back a few decades. The electronic cigarette was invented back when the tobacco cigarettes for the first time faced serious health risk suspicion. In 1963 an American named Herbert A. Gilbert patented the first cigarette without combustion or smoke. Sadly, this cigarette never went into production, probably due to the technology not being there at this time. Herbert A. Gilbert is still recognized as the being the person who took the first steps towards the e-cigarette. The modern e-cigarette was not invented until 2003 when a Chinese pharmacist, Hon Lik, founded the company Ruyan. In 2004 the first modern e-cigarette went out to the Chinese consumers. Two years later in 2006 the first e-cigarette was exported to Europe. At this time the health risks of the tobacco cigarettes had long been proven, which meant that a lot of people were seeking an alternative. The e-cigarette has not been changed much since the version from 2003. It still simply vaporizes water/e-liquid with or without nicotine for the user to inhale.